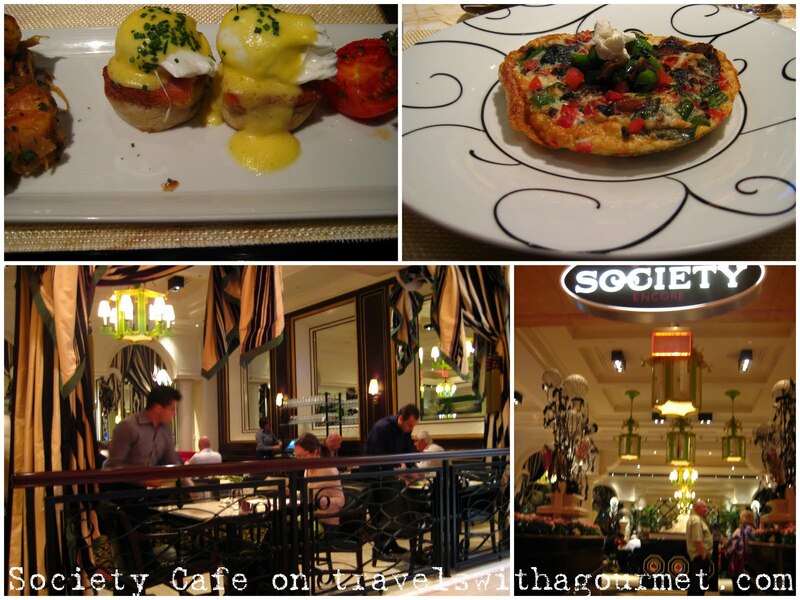 Bright and early the next morning, we walked over to Encore, the Wynn’s newer sister property, to have breakfast at Society Cafe. This newish all-day dining restaurant has an all-American themed menu but at breakfast, they serve up the classics in a sophisticated setting of bold greens and blacks and Chinese-inspired pale green lanterns hanging throughout the restaurant. When we were seated at one of the banquette tables in the front area, the restaurant had just opened and it was mostly empty. We ordered double espressos straight away along with fresh orange juice then took our time studying the breakfast specials. Society Cafe uses organic eggs so I didn’t feel guilty having the traditional Eggs benedict while A had the healthy egg white frittata. We also decided to share the homemade granola with fresh berries and organic vanilla yoghurt. Our espressos were served – perfect but a tad tiny considering we ordered doubles along with some cold, fresh and sweet orange juice. The eggs came next. The egg white frittata was fluffy and was stuffed with asparagus, mushrooms, goat’s cheese and oven-roasted tomatoes. My eggs benedict were beautifully presented on a large rectangular plate – two perfectly poached eggs on top of Canadian bacon and topped with creamy Hollandaise. The muffins were hard but tasted good enough. Next up was the breakfast granola – a large glass filled with granola and vanilla yoghurt with strawberries and blackberries scattered on top. The granola was chock-a-block with nuts and crunchy oats and the thick yoghurt was the perfect accompaniment. We shared another espresso and sat enjoying the morning music – jazz and Sinatra, before we meandered back to the Wynn.